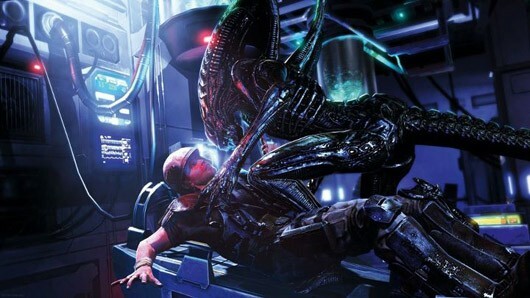 The cast of Gearbox Software's upcoming xenophobia sim, Aliens: Colonial Marines, won't be entirely male, the developer announced during a panel at last weekend's PAX Prime event in Seattle, WA. One female character named Jennifer Redding will be available in co-op, while the game's competitive multiplayer modes will include options for customizing different female marines. Since the announcement was made, a 3,800-person strong internet petition to have female characters added to the game has taken credit, updating with a message that "the petition is a SUCCESS!!! CONGRATULATIONS EVERYONE!, and thank you for your support!" Meanwhile, Gearbox CEO Randy Pitchford maintains that women were always part of the plan, according to Kotaku. Essentially, Gearbox had yet to complete the design work for Redding and the multiplayer models and did not want to unveil them until they were finalized. As the petition's online presence mounted, however, the developer felt it should show off the plans to resolve the situation. It would have been funny if Gearbox responded with, "Xenomorphs ARE female." But will this ever get released? 11 days and counting to the thing that's been on my Amazon wishlist for the longest time! Anyone getting it, anyone want to co-op with me? I'm getting it. I actually got to play it this weekend at the IGN Community event. It was a lot of fun. The multiplayer is amazing, and the Y button is a god among men when you are playing a Xeno. Unless you are Kini and leave your tail hanging down in front of a doorway and the entire enemy team notices and swarms her with deadly effect. The Escape mode was a lot of fun, marines have 1 life, and have to reach checkpoints and eventually escape the area to win the round. Xenos respawn together on a timer, and can switch which type they are (soldier, spitter, LURKER!!). Xenos were so much fun, but take way more getting used to for both sides - the use of the cieling and walls as terrain to walk and wait on is awesome, and can easily be used to surprise and outmaneuver marines. Upcoming DLC for Aliens: Colonial Marines has been outed in some promotional material for the game. 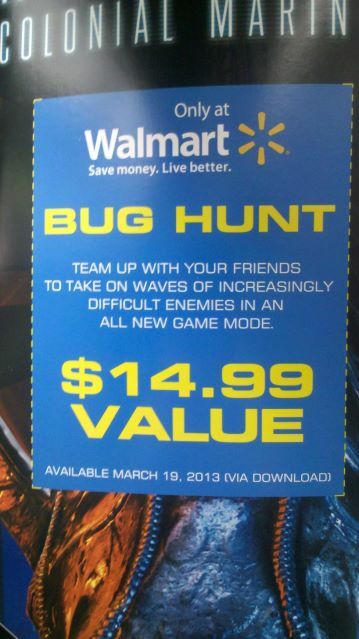 The news comes via a photo advertising a game mode called Bug Hunt, as posted in the Gearbox forums. “Team up with your friends to take on waves of increasingly difficult enemies in an all new game mode,” says the description. It’s Horde mode then. According to the ad, Bug Hunt will be available to download from March 19th, for $14.99. Aliens: Colonial Marines is out next week. I do love a good Horde Mode. 5 days and counting, I'm getting it day of release, so will be available for co-op if anyone's looking for people to play with. Must warn you though, I get scared shitless by xenomorphs, that bit when Ripley and Newt are locked in med-lab in and the facehugger jumps out at them still scares me even now despite having seen Aliens 30+ times.